A brother-sister combo from Cincinnati joined a third Cincinnati resident into the ITF quarterfinals with all winning straight-set matches at the 49th Annual ASICS Easter Bowl being played this week at the Indian Wells Tennis Garden. Seventeen-year-old John McNally, the No. 4-seeded player in the Boys’ ITF singles, beat unseeded Jake Van Emburgh, 7-5, 6-2, to make the elite eight at one of the biggest junior tournaments in the nation. Meanwhile, John’s 15-year-old sister Caty, the No. 9 seed, was handling business by beating unseeded Ann Li, 6-2, 6-2. Last year as a 14-year-old wild card entry, McNally shocked everyone with a second-round upset over the top-seed and a world-ranked Top 10 player, Usue Arconada. Both McNally’s decided to forgo coming to California for two full weeks, pulling out of the Carson USTA International Spring Championships last week and deciding to focus their attention on the ASICS Easter Bowl. The rest has paid off as the pair also advanced to the ITF in their respective divisions in the doubles, as well. John’s doubles partner, the No. 2-seeded J.J. Wolf, also hails from Cincinnati. Wolf, who beat unseeded Sangeet Sridhar, 6-2 6-2, was one of seven out of the eight singles quarterfinalist who are seeded with Gianni Ross the only non-seeded player to advance. After temperatures reached 100 degrees on Wednesday, things cooled off on Thursday as clouds covered the sky and there was a threat of rain for most of the day. Caty said the windy conditions didn’t bother her, even though she didn’t get a chance to play in it last week in Carson. Both McNally’s will face tough tasks in the quarterfinals on Friday as John faces last week’s Carson winner Liam Caruana and Katy plays top-seeded Maria Mateas. Last year’s finalist Sam Riffice beat a familiar foe in Keenan Mayo on Thursday, 6-2, 6-4. Riffice said after the match the two grew up in the same Roseville, Calif., neighborhood. Riffice, the No. 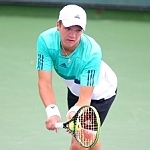 5-seed, faces 2015 ASICS Easter Bowl finalist Nathan Ponwith of Scottsdale, Ariz., in the quarterfinals. It will be a rematch of a back draw match Riffice won in three sets in Kalamazoo last year at the 18s National Hardcourts. Also making both the singles and doubles quarterfinals is last week’s Carson doubles champion Ena Shibahara, who will play for Stella Sampras-Webster at UCLA in the fall. Shibahara, from Palos Verdes Estates, Calif., advanced in doubles with her first-time partner Michaela Gordon. Last week, Shibahara won Carson playing with Hurricane Tyra Black. Shibahara-Gordon face the team of Black and McNally on Friday. In the boys’ 16s singles final starting at 9 a.m., it will be top-seeded Carson Haskins of Ballwin, Mo., taking on No. 11 Lukas Greif of Evansville, Ind. In the girls’ 16s singles final starting at 9 a.m., No. 7 Angelica Blake of Boca Raton, Fla., takes on No. 8 Abigail Forbes of Raleigh, N.C. In the Boys’ 16s doubles final the top-seeded Texas pairing of Trey Hilderbrand (San Antonio) and Kevin Zhu (Pearland) defeated the Southern California team of Brandon Nakashima (San Diego) and Jake Sands (Pacific Palisades), 8-2. In the Girls’ 16s doubles final, the Southern team of Chloe Beck (Watkinsville, Ga.) and Emma Navarro (Charleston, S.C.) won the title by beating Blake (Boca Raton, Fla.) and Reilly Tran (Dunn Loring, Va.), 8-5.